Looking for a great Virginia Beach family resort? We've found some great ones that suit families with young kids and teens really well. Here are our top picks. Location: in Virginia Beach, Va. The Virginia Beach oceanfront is 14 miles away. The hotel is on 26 landscaped acres. Amenities: The Founders Inn has a few restaurants. The Hunt Room has Colonial style fare with while the Swan Terrace Restaurant offers brunches on Sundays featuring fresh local seafood, desserts and cheese blintzes. Complimentary high speed Internet access is available most places including rooms. The hotel's Flowering Almond Spa offers an indoor pool, six treatment rooms and a meditation room with candles, music and views of the lake. The spa's fitness center includes cardiovascular and weight training equipment. The hotel includes a jetted tub overlooking a nearby lake and an outdoor pool. The pool includes fountains and a 25 foot enclosed slide. Rooms: The 240 guestrooms include balconies or terraces. Some have views of the landscaped grounds and the lake. Reviews: This one is not distinctly a family resort. In fact, most of the reviews aren't from families with small children but with families with teenagers. However that does not mean you can't go and have a pleasurable time with a family. The website is littered with photos of children and there is more than enough activities to do it with the beaches, amusement parks, historical landmarks and shopping outlets nearby. This all oceanfront suite hotel is located on the boardwalk. It's the newest one on the Virginia Beach oceanfront. Location: Virginia Beach Oceanfront. Less than one mile from Beach Mall. Close to the beach, rock climbing, bowling, and lazer tag for the families. Amenities: The website advertises a comfortable indoor heated swimming pool open year round from 7am-11pm for the family. Rooms: have a private balcony, chance of an amazing view, free high-speed Internet, 2 TVs, sofa bed and kitchenette. Reviews: The hotel's special touches like keeping the complimentary hot breakfast well stocked up, having computers in the lobby to print boarding passes, and the good rooms make a good impression on guests. Guests with small children and teenagers are quick to recommend this one and come back. 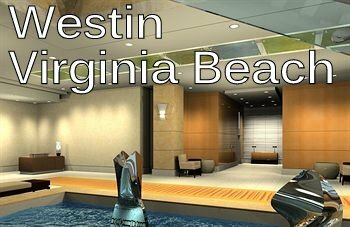 Location: All suites overlooking Virginia Beach. Amenities: direct beach and boardwalk access, indoor pool, fitness center and guest laundry. High speed wireless internet, valet parking, hot breakfast buffet and weekly barbecue are all complimentary. Rooms: Have a fully equipped kitchen with refrigerator, microwave and coffee maker and a private balcony overlooking the beach. Reviews: You would have to search hard to find a bad word about this hotel. The breakfast and beach experience seems a little above what others are offering in the area. Good food and the valet looking after cars (complimentary) were reported. The big spacious rooms and facilities around the hotel were a hit with families. Location: At the quieter end of the resort strip across from the Virginia Beach boardwalk. Amenities: Two pools with two elevated hot tubs, a large rock waterfall formation and comfortable lounge chairs, and tables make the outdoors a comfortable place to keep kids entertained. Indoor facilities are also as good or better. Rooms: Spacious suites with full kitchens, Jacuzzi tubs, and a washer and dryer. Calming colors, a gas fireplace, and a furnished patio overlooking the lush courtyard spell luxury. Reviews: The resort is recommended by families and singles alike. Guests liked the big rooms and the family friendly environment. Seems most aspects are outstanding bar the fact that the walls are perhaps a little thin and easy to hear through. 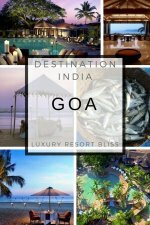 Unlike the other hotels on this page this one is not all about families. That's because we always try to include resorts with eco values where we can and want you also to have a fantastic luxury vacation. Location: on commerce street, town center. Amenities: this hotel also offers a heated indoor pool, whirlpool, and gym. The restaurant serves breakfast, lunch, and dinner or have 24-hour in-room dining. There is a lobby lounge. Rooms: The 236 guest rooms include Deluxe Rooms, Suites and a private Executive Club floor. All rooms have High Speed Internet Access, flat screen LCD televisions, dual showerhead. Reviews: Guests rave about the luxury a new hotel brings - especially before the bedding begins to age. Newness also makes for a cleaner place in many instances and guests really liked how clean this place is. Many say it is the best in the area. It rates well with families with teenagers and small children. Location: On beach in the northern resort area, adjacent to the boardwalk and five miles from downtown. Amenities: Indoor pool, seasonal outdoor pool, whirlpool and fitness room. Courtyard Cafe and quality restaurant, which serves breakfast buffets, lunch and dinner. A lobby workstation with a computer, printer and complimentary high speed Internet access is a nice touch. Rooms: Daily housekeeping, free high-speed Internet. 2-room suites make extended stays comfortable, with kitchenette & separate sleeping area. Romantic jacuzzi rooms feature a spa & ocean view. Reviews: Guests with families report that their children go home happy having met other children. The pool area seems a great attraction as well as the location. On the downside, there was an occasional report that the bathrooms in some rooms were not as big as other resorts. Guests on honeymoon also enjoyed this place. The Quality in has outdone itself a little with this one. Perhaps the highest rated hotel in Virginia beach with families. And for that reason we are going to include it as well. Location: On the boardwalk and at the start of Beach Street. Amenities: An indoor heated pool has a lap lane, fitness center, "RockFish" Bar and Grill, concierge and more. Rooms: Recently renovated studios, one, two and three bedroom suites have full kitchens, stocked for the family. Reviews: Some guests expected to have a balcony only to find they did not have one. 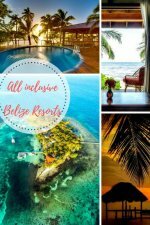 Many more had more positive experiences and the overall consensus is that this is an outstandingly great hotel for families. That is what it does well and does not really pretend otherwise. Free snacks for the kids everyday were appreciated by kids and teenagers alike. 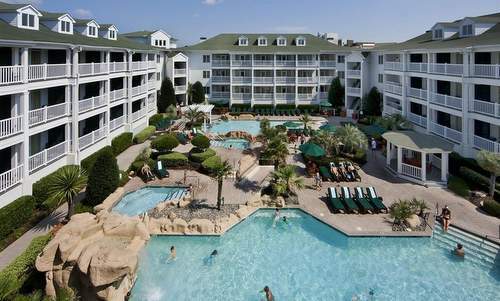 Did you find the Virginia Beach family resort you were looking for? If so, great! If not, try the family resorts in Florida.